Recent health scares suffered by SJM founder Dr Stanley Ho and Las Vegas Sands kingpin Sheldon Adelson are a stark reminder that the end of an era could come sooner rather than later, while raising questions as to who will one day replace the two most important figures in developing Macau’s casino industry. 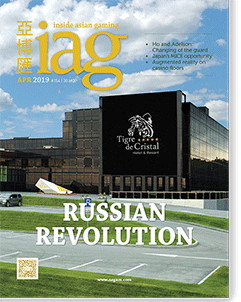 While license re-tendering looms as the most significant issue facing Macau in the coming years, perhaps the starkest reminder yet that a new era awaits the enclave’s gaming industry came during the first few months of 2019 as its two most influential figures, STDM founder Dr Stanley Ho and Las Vegas Sands Chairman and CEO Sheldon Adelson, suffered major health scares. On 9 February, reports emerged that Dr Ho had been rushed to the emergency room of a Hong Kong hospital after his condition suddenly deteriorated. Those reports, and others claiming he had been visited by numerous family members over the course of the next few days, were later denied by his third wife Ina Chan Un Chan and their daughter Laurinda, with no further updates provided since. Three weeks later, on 1 March, Sands China – the Macau subsidiary of Las Vegas Sands – filed an update in which it revealed that Adelson was dealing with “certain side effects” from medication he is taking to treat non-Hodgkin’s lymphoma, which had impacted his ability to perform normal work duties. The update followed speculation in the preceding days over Adelson’s health after an LVS lawyer informed a district judge that the company’s Chairman and CEO was unlikely to be fit to testify in a civil lawsuit. Nevertheless, at 97 and 85-years-old respectively, it is an inevitable fact of life that the reigns of Dr Ho and Adelson over the Macau gaming industry are now deep into their twilight – prompting the question: what will become of the gaming goliaths they created once their time finally does come to an end? No-one has had such an enormous impact on shaping modern-day Macau as these two men. Often referred to as the Godfather of Macau’s gambling industry, Stanley Ho’s influence dates back to 1962 when he and three colleagues – Henry Fok, Yip Hon and Teddy Yip – founded Sociedade de Turismo e Diversões de Macau, SA (STDM), having been granted a monopoly on operating games of fortune in the enclave a few months earlier. That monopoly lasted for 40 years and saw STDM operating a total of 11 casinos by the time of liberalization in 2001, including its first, Casino Estoril, opened in 1962, and the now iconic Casino Lisboa, opened in 1970. Dr Ho is also credited with introducing junkets to Macau in the 1970s, which today comprise around half of the SAR’s annual revenue of US$37.6 billion as of 2018. 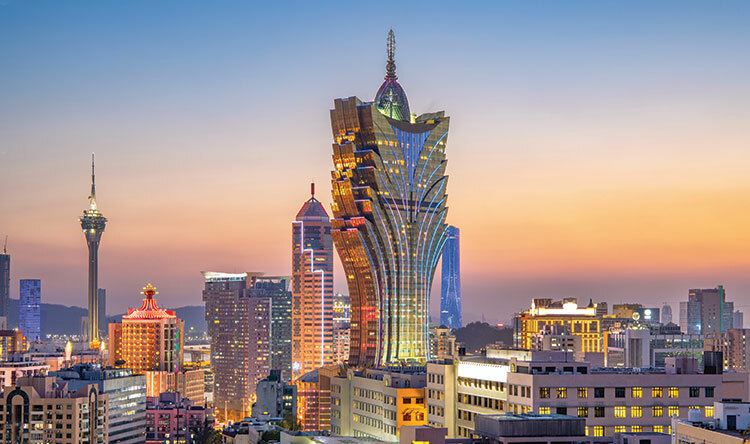 Back in 2001, when the decision to award three gaming concessions was first announced, Macau’s annual gaming revenue was US$2 billion – well below today’s numbers but remarkable nonetheless for a territory of just 435,000 people at the time, and almost all of it controlled by Dr Ho. Adelson’s influence, via Las Vegas Sands and its local subsidiary Sands China, has been the most strongly felt in the 18 years since 2001. One of the six companies granted either a concession or sub-concession to operate casino gaming following the transfer of Macau’s sovereignty from Portugal to China in 1999, it was the opening of Sands Macao in 2004 that truly set the SAR on the path to becoming the world’s premier gaming hub. Sands Macao completely altered global perceptions as to what Macau could be. Quickly brushing aside concerns that a Las Vegas-style casino would never work on the other side of the world, it is now part of Macau folklore that a crowd of 40,000 people literally broke down the doors (16 of them in total) on opening day at Sands Macao – a relentless rush that saw the company recoup its US$265 million investment in just nine months. It was also Adelson who recognized the potential of a 6.7-square kilometer mudflat known as Cotai, developing the concept of the Cotai Strip and leading the charge with construction of the world’s biggest casino, the Venetian Macao, in 2007. 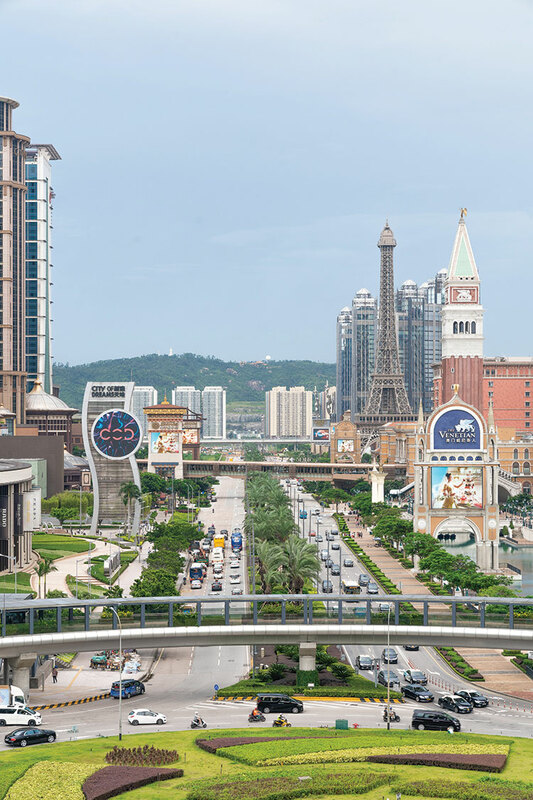 Today, the Cotai Strip is the heart and soul of Macau’s casino industry with nine integrated resorts in operation and a 10th due to open by the end of the year. Sands China runs four of them. 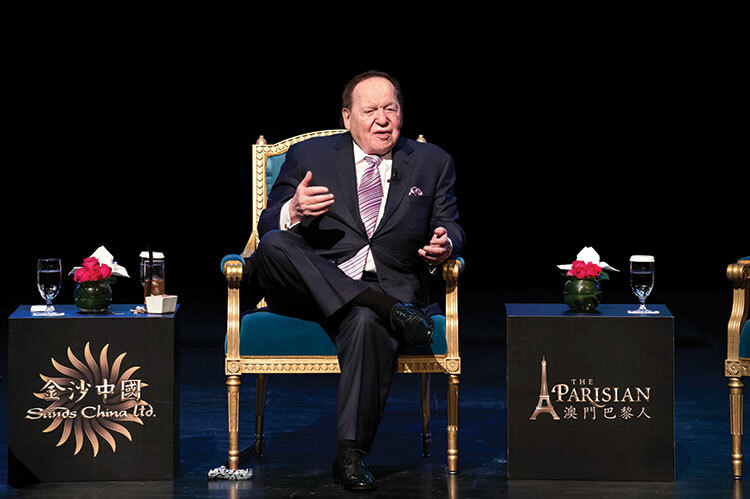 Despite these contributions, the ailing health of Adelson and Dr Ho – particularly with their current 20-year gaming concessions coming to an end in 2022 (the licenses of SJM and MGM were recently extended by two years from 2020 to align with the other four) – inevitably raises questions as to what their companies will look like once departed. In the case of SJM, keen observers couldn’t help but ponder the timing of a bold power play by Pansy Ho – Co-Chairperson and Executive Director of MGM Holdings and one of Dr Ho’s five children to second wife Lucina Laam – when she announced in January an alliance to take control of STDM just weeks before her father’s reported ill-turn. The alliance between Pansy Ho, three other companies controlled by her (Shun Tak Holdings, Lanceford Co Ltd and Interdragon Ltd) and The Fok Foundation took their combined interest to 53% of issued shares in STDM, which in turn holds a 54% stake in SJM Holdings. SJM is the holding company for Sociedade de Jogos de Macau, S.A. – one of the six companies to hold a Macau casino concession or sub-concession. It has long been speculated that Pansy Ho would one day move for control of SJM, having been a key figure in the uneasy truce that stalled a previous dispute over control of her father’s estate. After Dr Ho underwent brain surgery in 2009 following a serious fall in his home – he now receives full-time care in Hong Kong – it was Pansy Ho and her four full siblings, who include current SJM Chairman Daisy Ho and Melco Resorts Chairman and CEO Lawrence Ho, that engineered a deal to transfer shares in companies controlled by Dr Ho their way. The move was initiated shortly after Dr Ho had gifted his fourth wife, Angela Leong, a 7.03% stake in SJM in December 2010, making her the company’s second largest single shareholder at 7.63%. Amid a litany of legal challenges, claims and counter-claims that threatened to spiral out of control, the family truce – said by some to have been engineered by Beijing – was finally agreed in 2011 and saw Pansy Ho named a director of STDM, while Leong was guaranteed the role of Managing Director of SJM for a period of six years. That period expired in 2017. In a January 2019 note titled “Let the game of casino thrones begin”, Deutsche Bank research analyst Karen Tang suggested that formation of the new Pansy Ho-Fok alliance could well be the first step towards removing SJM’s current management, including Leong. While Leong is unlikely to go quietly, the appointment of Daisy Ho – a close ally of her sister Pansy – as SJM Holdings Chairman after Dr Ho officially stepped down from the board last June is intriguing. Clearly there is more of this saga to be written in the coming months. The succession plan at Sands appears more clear-cut. Adelson himself has laid the pathway for a relatively smooth transition once he exits the company, with son-in-law and current CFO Patrick Dumont having long been groomed to step into the leadership role. Although full details of such a succession plan have not been released publicly, Bernstein added, “The company has a capable management team running the operations and remains in good hands under the leadership of President and COO Rob Goldstein and CFO Patrick Dumont. It might not be all smooth sailing for Sands however. As one industry commentator told IAG, it wouldn’t surprise to see Adelson’s wife Miriam, 12 years his junior, become more vocal in guiding the company forward, most likely via refreshment of the LVS board. This would mirror the tactic used by Wynn Resorts’ largest shareholder, Elaine Wynn, to bring about widespread change following the fall of her ex-husband and former Wynn Chairman and CEO, Steve Wynn, last year. It’s also entirely possible that Goldstein, at 63 years of age, could be one of those to make way, potentially leaving a dearth of experience at the very top in regards to day-to-day operations of the global casino giant. One thing is for certain, though – while Adelson and Dr Ho will eventually make way, their legacies will live on for many decades to come. 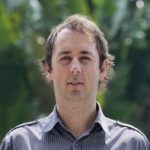 A former sports journalist in Sydney, Australia, Ben has been Managing Editor of Inside Asian Gaming since early 2016. He played a leading role in developing and launching IAG Breakfast Briefing in April 2017 and oversees as well as being a key contributor to all of IAG’s editorial pursuits.